Cryptocurrency Lotteries – Are They To Be Avoided? Advent of Cryptocurrency Lotteries – Should You Play the Lottery with Bitcoins? I know one thing’s for certain, the world, as we know it, is rapidly changing. Any area of our lives is affected by these seemingly unimportant, incremental changes. Heck, even the lottery is changing. Although, the basic principles are kept intact, how we play it, and how we enjoy it has changed drastically over the past two decades. But these changes haven’t ended. It’s still reshaping! One of the latest additions to the online lottery is cryptocurrency lotteries featuring the Bitcoin. Without further ado, I will show you what you must know about these revolutionary cryptocurrency lotteries. But, first thing’s first, let’s take a look at what the two basic terms are. Cryptocurrencies are becoming recognized as a legit commodity. They exist only on the internet and solely because there’s a demand for them. The flagship, most popular cryptocurrency is the Bitcoin. It’s a code that looks odd, but strangely, it’s worth a lot. The Bitcoin is known to be highly volatile. With proper knowledge, it’s a safe and reliable currency that brings forth features only, or in other words, it literally is flawless. You can store these Bitcoin codes both offline and online. I recommend getting familiar with these processes thoroughly before you indulge in getting some Bitcoins. Note, there are many other cryptocurrencies, some of which are less volatile than the Bitcoin. Now, believe it or not, you can actually play the lottery with a cryptocurrency, which leads us to the next point. 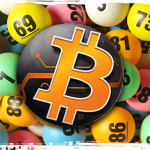 As the name suggests, Bitcoin lotteries are in fact lotteries that can be played in Bitcoin. However, there are way more differences than this. Many cryptocurrency advocates claim this is the how the future looks. I tend to disagree. It’s a wonderful model, but once I got familiar with how these work, I was confused and reluctant to join. Call me conservative, but I love the online lottery as it currently is. What’s enough, is enough. So, you deposit, you play and you withdraw your winnings in Bitcoin. 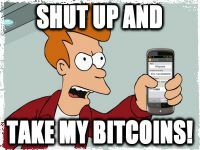 One of the things you will need is a Bitcoin e-Wallet. Before anything else, you must set up one. One of the main deterrent qualities of playing a cryptocurrency lottery is that all of them can go bust in a blink of an eye. It’s not like the USD or the EUR can become worthless overnight. Nevertheless, any of the cryptocurrencies can. Speaking of volatility, the Bitcoin had a value of roughly $1,000. In a few days, it plunged to $600. In a month’s time, the Bitcoin had a value of $2,000. That’s right, that’s three times the value over a month’s time. Now, it can go both ways. It can go up, but it can also go down. If it goes up, you’ve made a gain, a profit, like investors do with the Forex Stock Exchange. There are lottery players who are worried about their privacy. Providing personal and banking information to any person over the internet doesn’t sound so nice. Well, these cryptocurrency lottery operators do not ask for any information. All you need is your Bitcoin email. Usually, an operator will request a scan of your ID at some point in time. Cryptocurrency lotteries will never do such a thing. You don’t even have to register, to open an account with them. I never thought something like this will be a reality. Can You Really Trust Bitcoin Lottery Operators? I’ve asked this question more than I’ve had fights with my S/O. Okay, that’s not the best comparison, but you get the idea. Am I going to get my winnings cashed out properly and in a timely fashion? After all, these guys don’t ask for more my personal information. How in the world can I establish a relationship? Let me tell you one thing. It’s all based on trust. You can find tons of reviews of cryptocurrency lotteries. Make sure you find reliable ones, or you might end in trouble. Final summation regarding this, yes, you can trust cryptocurrency lotteries. These people are aware that if they blew it once, they’ve blown it forever. By the way, usually, these operators return up to 99% of the revenues coming from lottery tickets, which says a lot about how generous they are. That’s right. First, you need to buy some Bitcoins and you can start playing the lottery online anonymously. You can also withdraw your winnings in Bitcoin. Now, at this very moment, the Bitcoin is experiencing a major expansion. Japan recognized it as a legit commodity, which just secured Bitcoin’s future. It’s recognized and accepted by many other countries like the USA, Canada, Sweden, Finland, Germany and Norway to name a few. So, once you cash out your winnings, you can sell the Bitcoin, get USD, or EUR, or any other currency you want. You can then go to an ATM and withdraw your money, in conventional currency. Go shopping, buy lottery tickets for your local lottery, do whatever you want. It’s as if you’ve won a conventional lottery. It sounds odd, but think of it as if you’ve won a foreign lottery and you had to play it in foreign currency. Here are a couple of general points that need your attention. Always check the reviews and look for first hand experiences. If a fellow lottery player has gotten into trouble, you don’t have to. However, you have to look for any positive or negative comments on the operator. You should know with whom you’re getting in bed. That sounded, odd. Because the regulations are loose, not much can be done if you get scammed. The only thing you can do is spread the word. Some of the cryptocurrency operators are not licensed. If this is the first ever occasion you’ve gotten in contact with cryptocurrency, you need to do some research yourself. Setting up security, how the Bitcoin works, what are the threats of owning a volatile currency, in a way you will become an expert in cryptocurrency security. The thing is, all these different cryptocurrencies carry their own threats and opportunities. Getting in the zone with them is difficult. In fact, it’s like a full time job. Their value changes on a daily basis, and I’m talking big time. Like the aforementioned example, the value of the Bitcoin doubled over a period of 1 month. Nobody expected that. However, nobody expects that the Bitcoin will go down, and if that happens, many people will lose all hope in this particular cryptocurrency. As a lottery player, as long as you’re winning, you can’t feel any differences. When you make the next deposit, you will definitely feel a shift in the currency unit value. Also, if you haven’t withdrawn in a long time, say you’ve just won a hefty prize, the change in the exchange rate can have a huge impact. Say you’ve won 5 units of a cryptocurrency, worth $200 each. That’s $1,000. However, when you first deposited each of them was valued at $100. You made a profit because you won a cryptocurrency lottery and because the currency itself appreciated. Your Experience, Skills and Knowledge in Lottery Still Counts! Yep, in the end the game doesn’t change. The same rules apply. The basic principles are kept intact. Your key approaches to winning the lottery still count. Who knows, this could be the your moment. Maybe you weren’t meant to win your local lottery and become famous. Maybe you were meant to become a great cryptocurrency lottery winner, that has to live with the prize without anyone knowing that you’ve actually won the lottery already. Bitcoin is just the tip of the iceberg when it comes to cryptocurrencies. Others, such as Ethereum, Steem and Stratis are much more than just ‘digital money’. They enable the building of decentralized applications using smart contracts that are creating web 3.0. Everyone should be learning about them and starting to use them because the internet and much of our business will be using them in the future. 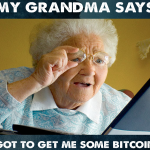 Bitcoins and the Lottery: A Match Made in Cyber Heaven! Online Lottery Is Dead, Long Live the Bitcoin Lottery! 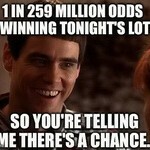 Want to Get Lucky and Win the Lottery? Should You Consider Going International?